Easy Weight Loss, Without Dieting! If you are tired of fad diets and want weight loss without counting calories, then don’t despair. By eating more nutritious foods and practicing portion control, it’s easy to lose weight without dieting. For example, if you can replace unhealthy foods with more healthy ones, you’ll automatically be reducing calories. Add in some moderate exercise a few times a week, and you are on your way to a slimmer body without the stress of following a strict diet plan. Really? Weight Loss Without Dieting? The first thing you need to do is assess your current eating habits. Write down what you eat during a typical day (be honest), and then begin to consider more healthy alternatives. For example, if you eat a lot of white bread and pasta, think about eating whole-grain varieties instead. There are many delicious whole-grain breads and pastas available at your local health food store. Do you like sugary foods for snacks and desserts? If you can find healthier alternatives to the sweet foods you are currently eating, your tummy will become flatter and your body weight lighter. One of the best substitutes for a sweet dessert is a bowl of fresh fruit. For example, slice a banana, an apple and some strawberries and stir them all together. You won’t need to add any sugar at all – it’s a delicious and naturally-sweet dessert! Many of the foods we eat on a daily basis get a high percentage of their calories from fat. Usually there are low-fat or non-fat options available, so whenever possible try to eat low-fat alternatives to your favorite foods. Another source of unnecessary calories comes from what we drink each day. If you like soft drinks, understand that they are packed with sugar and calories. Diet drinks or diet tea are better for helping to reduce your daily calorie consumption. As a general rule, a low-fat diet should consist of no more than 65 grams of fat per day. Healthy foods that are low in saturated fat and total fat include nuts, fish, fruit and grains. Simple steps you can take to switch to a low-fat diet include drinking skim instead of regular milk, eliminating fried foods, and replacing high-fat dairy products like sour cream and cream cheese with low-fat versions or yogurt. Many common recipes can be altered to low-fat versions by replacing certain ingredients with reduced-fat or fat-free substitutes. If you are struggling to design a low-fat diet that works for you, consult with a nutritionist for suggestions. One of the best ways to lose weight without going on a diet is to simply put less food on your plate. Pay careful attention to how large a portion you normally serve yourself. If possible, reduce it by one-third to one-half and then eat more slowly. You’ll probably be amazed by the results! Here’s a simple way to exercise portion control: Divide your plate in half. Fill one side with fruits or vegetables, leaving the rest for your main dish. By doing it this way, you start to understand what a properly-balanced meal should look like. Your main dish is only half your meal – fruits and vegetables should make up the remainder. In addition to adopting sensible eating habits through better food choices, it’s vital that you do moderate exercise a few times a week. Even if you only have 20 or 30 minutes to spare, try to move your body in some way in order to burn more calories. For example, a brisk walk around the block can be a great way to get some quick exercise. If your office is fairly close by, then consider riding your bike to work instead of taking the car. Even five or ten minutes of exercise can be effective if done on a regular basis. Try climbing the stairs a few times at your workplace during your lunch break. If you don’t like going to the health club, then get some exercise out in the garden. 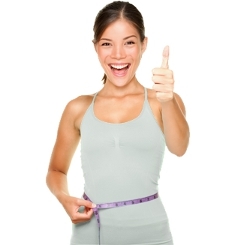 One other alternative for people who are seeking no diet weight loss is to find a good appetite suppressant. Natural appetite suppressants include soluble fiber foods like oats, barley and citrus fruits. Herbal appetite suppressants are also available in the form of over-the-counter tablets which do not require a prescription. These types of suppressants are usually reasonably priced, but may come with certain side effects. The purpose of weight loss pills is to control appetite so that you won’t feel hungry. If they work, then it’s possible to achieve weight loss without exercise. But before taking any supplement or diet pill, be sure to check first with your doctor. You really can lose weight without dieting, but it’s not really “weight loss without trying.” It will take effort to change your eating habits. At the end of the day, if you can burn more calories through exercise while cutting down on the amount of junk food you eat, you will achieve weight loss success. Wondrous Weight Loss: Water You Saying? ?